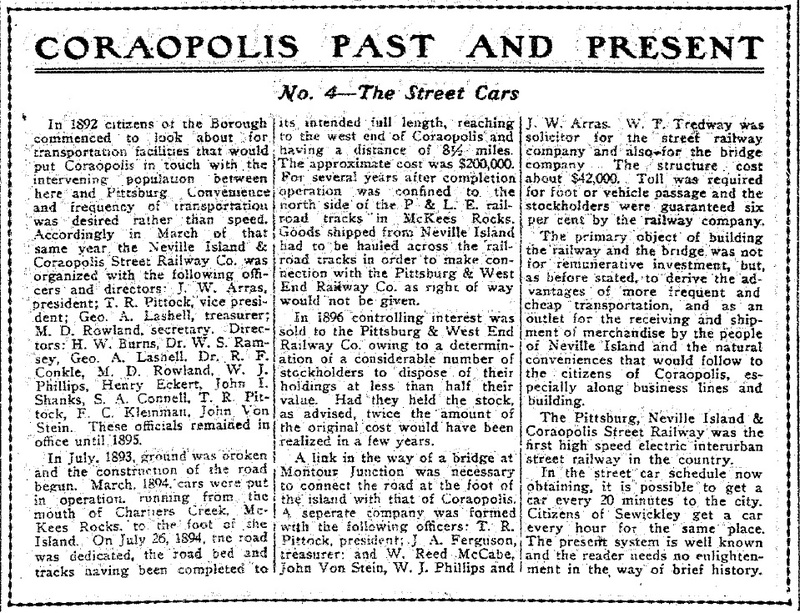 “Coraopolis Past & Present” was a series of history articles released by The Coraopolis Record Newspaper during the Spring and Summer of 1917. Topics discussed include Incorporation of the Borough of Coraopolis, Pennsylvania, The Coraopolis Oil Industry, Consolidated Lamp & Glass Company, Coraopolis Street Cars, The Coming of the Pittsburgh & Lake Erie Railroad, the Coraopolis Water System (now CWSA, or Coraopolis Water Sewer Authority), The Light Plant (which was the Electric Plant in Coraopolis), Coraopolis Burgesses (the Coraopolis Mayors of yore), Coraopolis Schools (present day Cornell School District). These vignettes provide excellent insight into the history of the Borough of Coraopolis, located in Allegheny County, Pennsylvania along the Ohio River.